SACRAMENTO, California, April 2, 2015 (ENS) – Following the lowest snowpack ever recorded and with no end to the drought in sight, California Governor Jerry Brown Wednesday announced actions that will save water, increase enforcement to prevent wasteful water use, streamline the state’s drought response and invest in new technologies that will make California more drought resilient. For the first time in state history, the governor has directed the State Water Resources Control Board to implement mandatory water reductions in cities and towns across California to reduce water usage by 25 percent. This savings amounts to 1.5 million acre-feet of water over the next nine months, or nearly as much as is currently in Lake Oroville. “Therefore, I’m issuing an executive order mandating substantial water reductions across our state. 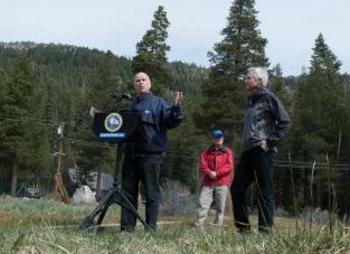 As Californians, we must pull together and save water in every way possible.” said Brown. For more than two years, the state’s experts have been managing water resources to ensure that the state survives this drought and is better prepared for the next one. Last year, the Governor proclaimed a drought state of emergency. The state has taken steps to make sure that water is available for human health and safety, growing food, fighting fires and protecting fish and wildlife. Agricultural water users, who have borne much of the brunt of the drought to date, with hundreds of thousands of fallowed acres, significantly reduced water allocations and thousands of farmworkers laid off, will be required to report more water use information to state regulators, increasing the state’s ability to enforce against illegal diversions and waste and unreasonable use of water under the order. The Governor’s action strengthens standards for Agricultural Water Management Plans submitted by large agriculture water districts and requires small agriculture water districts to develop similar plans. These plans will help ensure that agricultural communities are prepared in case the drought extends into 2016. • Making permanent monthly reporting of water usage, conservation and enforcement actions by local water suppliers. • Prioritizes state review and decision-making of water infrastructure projects and requires state agencies to report to the Governor’s Office on any application pending for more than 90 days. The order helps make California more drought resilient by incentivizing promising new technology that will make California more water efficient through a new program administered by the California Energy Commission.